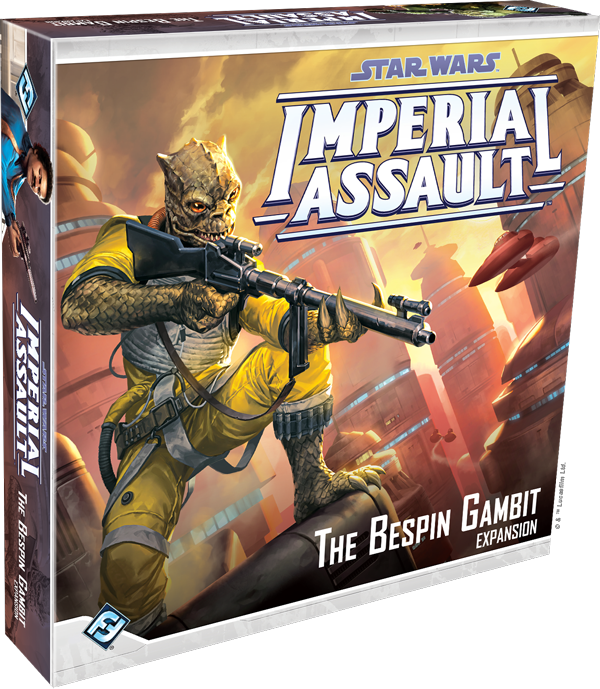 Fantasy Flight Games is proud to announce The Bespin Gambit, a new expansion for Imperial Assault! The effects of the Galactic Civil War can be felt on every planet of the Star Wars™ galaxy. On industrialized planets, the inhabitants may be forced to work in brutal conditions, slaves to the construction of the Imperial war machine. Other worlds may be torn by war as legions of Stormtroopers and massive assault walkers squelch any dissension against the Empire’s rule. On other planets, however, the war is fought in secret, in the shadows of dark alleys, disused conference rooms, and secret meetings. Information is exchanged between faceless Rebel spies, even as the terrifying Imperial Security Bureau searches for their undercover foes. 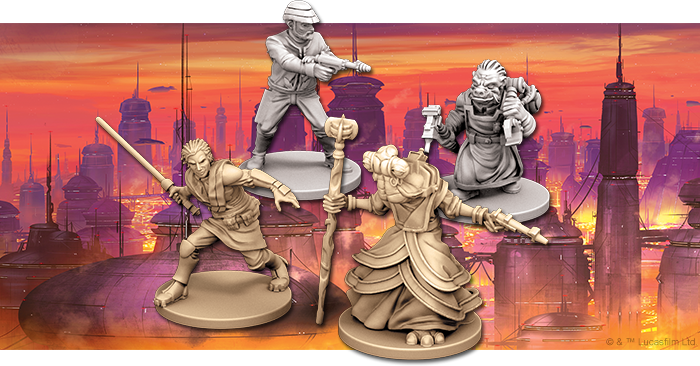 Now, The Bespin Gambit brings this shadow war to your games of Imperial Assault. In The Bespin Gambit, you’ll find a wealth of new content to take your campaigns and skirmishes into the ritzy hotels and industrial underworks of Cloud City. Iconic characters like Bossk and Lando Calrissian join the game for the first time, gorgeous new map tiles portray some of the most memorable Cloud City locations, while new companions and a new condition change the flow every game. With two new Rebel heroes, one new Imperial class, new items, a new mini-campaign, and a new focus on your Spy characters, The Bespin Gambit offers an indispensable bonus to every Imperial Assault player. The Bespin Gambit is also joined by four new figure packs that introduce new missions, cards, and detailed, sculpted figures of their subjects. You can learn more about the Lando Calrissian Ally Pack, the Bossk Villain Pack, the Agent Blaise Villain Pack, and the ISB Infiltrators Villain Pack in their announcement article here. You’ve outwitted the galaxy’s deadliest bounty hunters among the tangled streets of Tatooine’s spaceports in the Twin Shadows expansion. You’ve walked through icy fields of snow and fled from the Empire’s oncoming walkers with Return to Hoth. Now, The Bespin Gambit takes you to another iconic location from the Star Wars universe: Cloud City. Under the control of Baron Administrator Lando Calrissian, Cloud City has become a prosperous center of industry and tourism—and a center for the undercover conflict between Rebel spies and ISB agents. With the unique figures and tiles included in this expansion, you can recreate Cloud City as you first saw it in The Empire Strikes Back. From luxurious guest quarters and balconies, to narrow gantries stretching over an endless void, to the dramatic atmosphere of the carbon freezing chamber, a familiar environment greets you everywhere you look, even as you experience an entirely new story. The Bespin Gambit’s contributions to the campaign game center on an entirely new mini-campaign. On Cloud City, an agent working under the command of Lando Calrissian has infiltrated the Imperial Security Bureau and secured a number of top-secret military codes. Unfortunately, contact with the agent was lost immediately afterwards. The stage is set for a shadow war—the Alliance has dispatched a few covert operatives to find the missing agent, even as the ISB races to recover its missing codes. 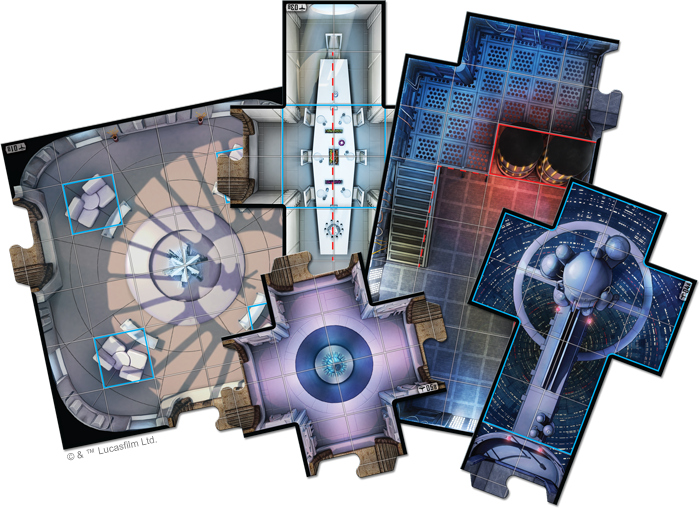 You’ll also find an entirely new skirmish map in The Bespin Gambit that takes full advantage of the stunning new tiles included here. With two distinct missions, this skirmish map challenges you to control the Carbon-freezing Chamber, whether you’re freezing your opponent’s figures in carbonite or fighting for control of precious tibanna gas reserves. For Rebels across the galaxy, The Bespin Gambit offers the chance to add two new heroes into your strike teams, whether you're traveling to Cloud City for the new mini-campaign or skirmishing against an enemy strike team. One of the new heroes is Davith Elso, a Force user and a master of stealthy operations. 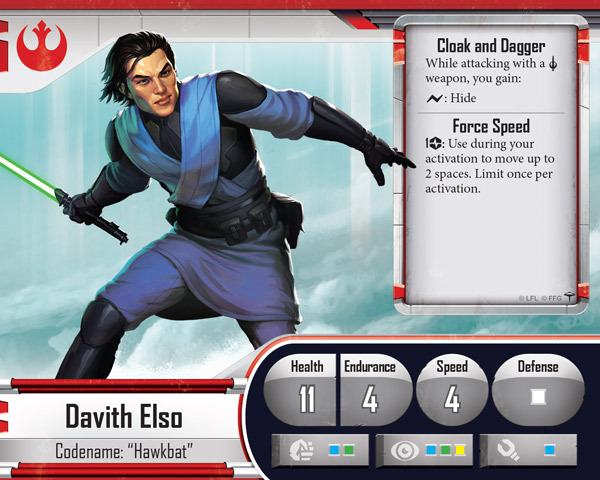 In battle, Davith Elso is fast and elusive, using the power of the Force to hide his attacks from his enemies until it’s too late. Davith also offers you an opportunity to explore the new condition introduced in The Bespin Gambit: Hidden . As long as Davith Elso is wielding a melee weapon, he can spend a surge in combat to Hide—while Hidden, you reduce the accuracy of any attack targeting you, increasing the chance that ranged attacks will miss. 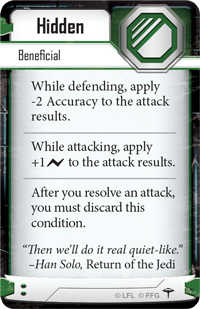 What’s more, you gain an automatic surge to your first attack as you use the element of surprise to gain the upper hand. After your attack, you lose your Hidden condition, but if you prefer to wait and strike at the opportune moment, Hidden can keep your figures alive until they attack. Davith Elso isn’t the only new hero the Rebels gain in this expansion. They also receive the aid of Murne Rin, an Ithorian intelligence master who excels at passing false information to the enemy and keeping your own heroes out the enemy’s firing lines. With entirely new decks of Class cards, both new heroes offer never-before-seen playstyles. When you combine the Rebel heroes’ Class decks with new Item cards and Supply cards, you’ll be able to customize your character to create whatever hero you want to play. We’ll take a closer look at the Rebel heroes and explore their role in the skirmish game in a future preview! The Mercenaries of the Star Wars galaxy also receive reinforcements with the upcoming release of The Bespin Gambit. Two new figure groups enter the game in this expansion—the renowned Cloud City Wing Guard and the Ugnaught Tinkerers who work and live in the depths of the floating city. Both new figure groups owe their allegiance to the Mercenaries faction, rather than the Galactic Empire or the Rebel Alliance, though the Imperial player can still take full advantage of these figures during a campaign game. The Ugnaught Tinkerer and the Junk Droid companion are a natural team. 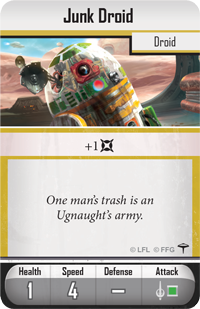 One of these figure groups, the Ugnaught Tinkerer , introduces brand-new rules to the game by using their junk droids as warriors. As an action, an Ugnaught Tinkerer can place the Junk Droid companion in an adjacent space. Companions function like normal figures, but their abilities and activation are tied to the card that brought them into play. In this case, the Junk Droid can ready at the start of the Ugnaught Tinkerer’s activation. Then, it activates as if it were part of the Ugnaught’s group, even using the Ugnaught’s surge abilities for its attacks. 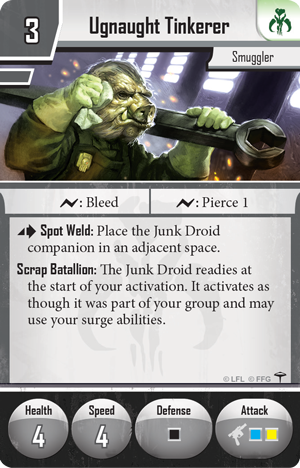 Rebel operatives and ISB agents alike should be wary of the Ugnaught Tinkerers when they’re surrounded by Junk Droids. New figures aren’t the only ways to expand your power as the Imperial player in The Bespin Gambit, of course. 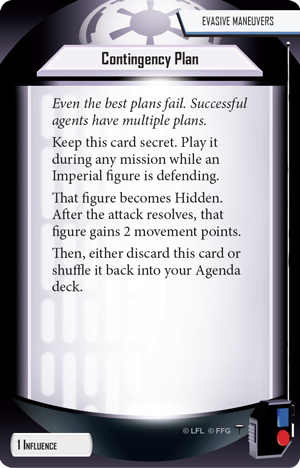 You’ll also find two new Agenda sets, including cards like Contingency Plan , which you can use to become Hidden without warning. You’ll also find an entirely new Imperial class—Imperial Black Ops. 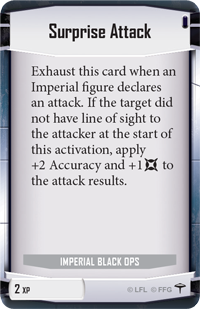 By hiding and striking from cover with cards like Surprise Attack , the Imperial Black Ops class may be your key to winning the war of subterfuge and sneak attacks in Cloud City. You’ll be able to get a closer look at these new Mercenaries figures, as well as the new Agenda and Imperial Class cards in upcoming previews! The Bespin Gambit contains two hero figures, three Ugnaught Tinkerer figures, and six Wing Guard figures. From the finest hotels and casinos to dingy, dangerous industrial passages, Cloud City is yours to explore. 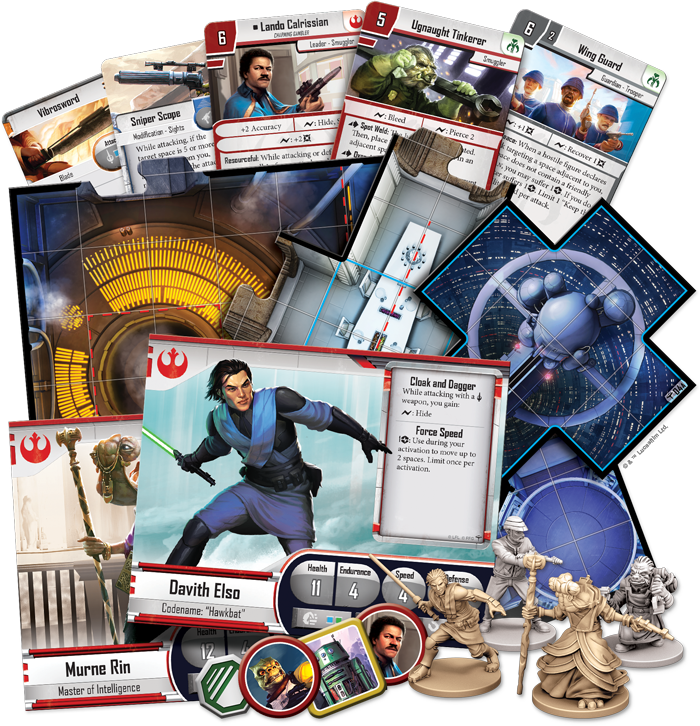 Lead your spies onto the battlefield of the Galactic Civil War, and look for The Bespin Gambit at your local retailer in the second quarter of 2016!